Bluebells are probably one the most well known wildflowers found in the British Isles, sometimes carpeting whole woodland floors in early spring with brightly coloured flowers, which appear April-May. 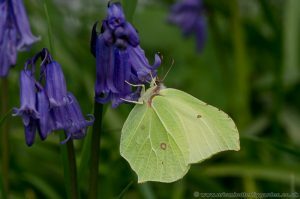 Bluebells are an important nectar source in early Spring for native British butterflies such as the Brimstone (Gonepteryx rhamni) , Orange-tip (anthocharis cardamines)and Pearl-Border Fritillary as well as other insects such as bees. 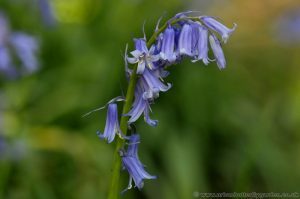 The native British Bluebell has become rare in some parts of the country due to cross pollination with the less colourful Spanish Bluebell (Hyacinthoides hispanica) creating hybrids, and the loss of ancient woodland habitat. It is important that when buying and planting bluebells in the garden or elsewhere, that native species like “Hyacinthoides non-scripta” should be used, rather than the Spanish variety. One of the easiest ways to tell Native bluebells apart, from the non-natives and Hybrids species is to look inside the flowers at the pollen on the anthers, to ensure this test is truly accurate, it is best to catch them just as they begin to bloom. Native English bluebells should have light creamy coloured Pollen on the anthers, any differences in colour such as light blue or a pale Green it is non native, also differences in colour, scent and shape of the flower are good indicators. 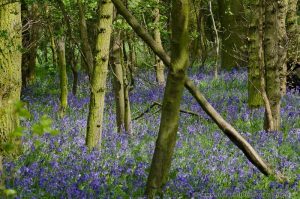 Bluebells are best planted and will thrive, in moist well drained soils, rich in organic matter in the dappled shade of deciduous trees or hedgerows. Prior to planting add plenty of garden compost or well rotted manure to improve the soil, this will also help to ensure that the bulbs remain moist throughout the year. 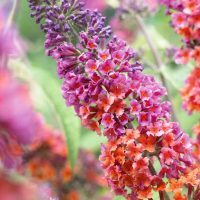 When planting, you can randomly scatter the bulbs across the planting area for a more natural look, then plant at a depth of about 10cm in the soil. For a more uniform look place 10cm apart. During the warm summer months, the bulbs should be kept moist until they are fully established, it is also very important to let the foliage die back naturally. 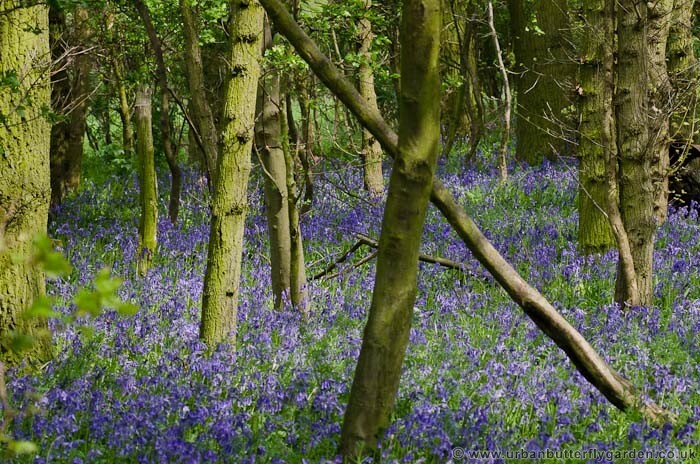 When Did Bluebells become Protected? In the UK the native Bluebell was first protected under the wildlife and country act 1981 making it an offence, to remove or sell the bulbs and seeds, taken from the wild, this was later enforced again in 1998. 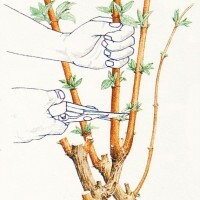 Buying English Bluebells from a Reputable Nursery, ensures they are cultivated from renewable stocks, it is also best to buy them “in the green”. Buying bulbs in “in the green” offers a much higher success rate of the bulbs flowering in the Spring, than buying dry bulbs.